1. Place coconut in resealable plastic bag or plastic food storage container with a secure lid. 2. Add four drops food coloring and close bag or container. 3. Shake vigorously until coconut is evenly tinted light green. Add two more drops food coloring and repeat. 4. Pour coconut onto a paper towel lined plate to air dry. 5. Place angel food cake onto a serving plate with the widest part resting on the plate. 6. Frost top and outside of the cake reserving 1/4 cup of the frosting. 7. Sprinkle tinted coconut over cake top and lightly press coconut into frosting on sides of cake. 8. Arrange jelly beans on top of cake pressing into frosting to secure. 9. Place two Peeps bunnies laying horizontally (one atop the other) into center opening of cake. 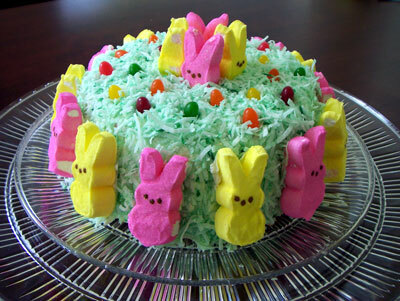 This will help support the the four Peeps bunnies emerging from the center of the cake. 10. With reserved frosting, frost the lower front side of four Peeps bunnies and press around the opening in the center of the cake just so their heads are emerging from the center. Peeps bunnies should be facing outward. 11. Drop leftover coconut into center of cake opening. 12. With remaining frosting, frost the backside of enough Peeps bunnies to surround the outside of the cake. Press lightly to secure. Leave half an inch or so of space between each Peeps bunny. This cake makes a delightful center piece. For an extra festive touch, spread decorative Easter grass (used in Easter baskets) in the center of the table surrounding the Peeps Bunny Cake. Additional jellybeans and other marshmallow Peeps can be placed in the grass.